The second Annual Catalan Meeting on Computer Vision (ACMCV) was held on the 18th of September in Universitat Pompeu Fabra of Barcelona. ACMCV was created with the aim of strengthen the network between computer vision researchers in Catalunya. As it is well known, Catalunya has a large community working in the computer vision field, both in the industry and the academia. Thus, this meeting is intended to get to know the people working in the field as well as their recent developments. 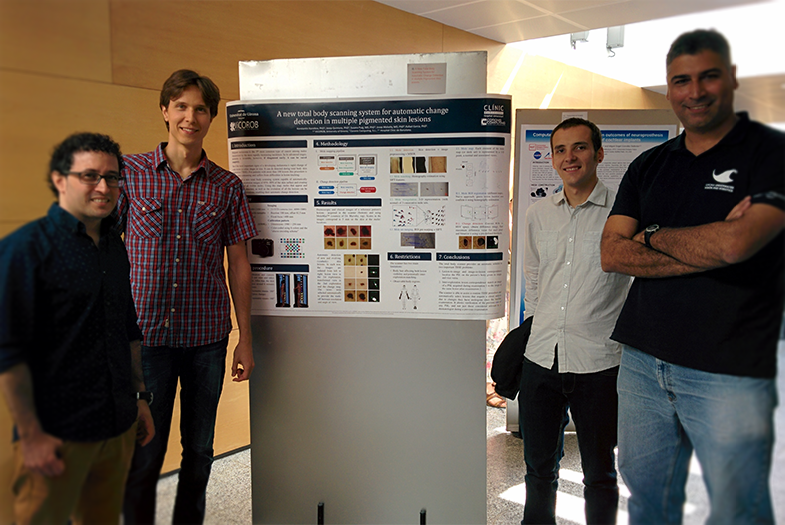 The event contained several activities, including a poster session, where the four members of Vicorob (Nuno Gracias, Josep Bosch, Konstantin Korotkov and Ricard Campos) presented their latest works. The meeting also held the Master thesis’ presentations of the students of the Master in Computer Vision of the Universitat Autonoma de Barcelona, as well as several interesting talks on topics such as the application of machine learning techniques using MATLAB, funding opportunities for technological companies within the Eureka programs and the post-PhD experience of a Catalan researcher working at Microsoft. K. Korotkov, J. Quintana, S. Puig, J. Malvehy, R. Garcia. A New Total Body Scanning System for Automatic Change Detection in Multiple Pigmented Skin lesions. In IEEE Transactions on Medical Imaging, 2015. R. Campos, R. Garcia, P. Alliez, and M. Yvinec. A Surface Reconstruction Method for In-Detail Underwater 3D Optical Mapping. In International Journal of Robotics Research, 2015. J. Bosch, N. Gracias, P. Ridao, D. Ribas. Omnidirectional Underwater Camera Design and Calibration. In Sensors, 2015.